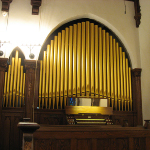 With regular tuning and maintenance a pipe organ will sound its best and give reliable service for many decades. Each year we maintain over 300 organs throughout the Northeast, Mid-Atlantic and Southeast  from northern Maine to South Carolina, from western New York to the islands off eastern Massachusetts. 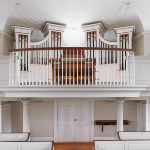 These instruments range in size from small one-manual organs in country churches to the world-famous 4 manual, 116 rank Great Organ in the Methuen Memorial Music Hall; and range in age from a few years to an historic 1762 Snetzler organ. Our technicians are skilled in servicing all types of organ mechanisms  from traditional tracker action to modern solid-state relays and combination actions. Each spring and fall, we schedule extended maintenance tours to visit multiple instruments in a particular geographical area. This enables our customers to share travel expenses, at a considerable savings over the cost of an individual trip for a single instrument. We are usually also available on short notice for last-minute emergencies. Re-leathering of historic or modern reservoirs. Repair and repacking of wood pipe stoppers. Repair and replacement of metal pipe tuning scrolls and sleeves. Repair and reinforcement of leaning or collapsing pipes. Repair of dented, bent or crushed pipes. Repainting and redecoration of pipe facades. Re-regulating or re-voicing of existing ranks of pipes. Electrical upgrades of console relays and combination actions. Repair or replacement of organ blower motors. Organ protection and wrapping for construction projects. 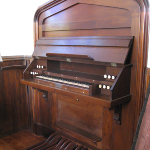 Organ appraisals for insurance coverage. Organ examinations and condition reports for long-range planning or damage claims. Consultations on organ projects done by others. Please contact us for more information regarding your specific issues and needs.